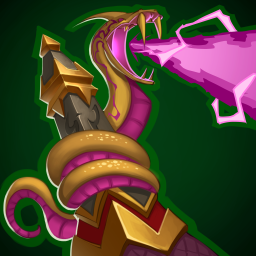 The Mystic summons a serpent that can fixate on a single target firing a beam that damages them over time. The beam grows more intense the longer it attacks a single target. Sand Viper deals damage to one enemy. His attack damage starts at 1x dmg and every next tick done on the same target deals 15% more damage up to 8 ticks (2.2x damage). Can be expanded by Slow Death sphere that will low Sand Viper initial damage by 10% but it will increase every tick damage by 25% more damage (3x at max). Can also be upgraded by Slip Vipers sphere that split up one beam to three beams but no longer deals increased damage over time. This page was last modified on 26 September 2018, at 01:56.